Closed-end blind rivets offer higher shear and tensile strengths, good vibration resistance, 100% mandrel ball retention and a water-resistant seal when installed in a defect-free hole. We offer closed-end rivets in stainless steel (304 stainless steel body, 420 stainless steel mandrel), all-aluminum and aluminum body with either a coated steel or stainless steel mandrel. 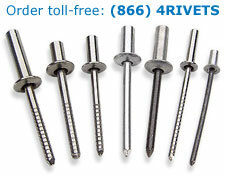 Our closed-end blind rivets meet IFI Specification 126.